Ngu Xa villages are located in the Truc Bach lake shore west Hanoi Truc Bach lake through the West lake. Around the West lake focus of famous trade villages of Thang Long imperial in many centuries – flower textile trade and paper of Yen Thai, cast bronze of Ngu Xa. 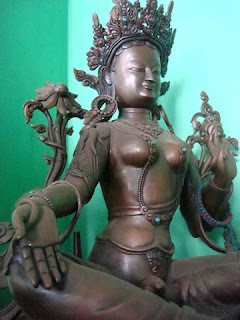 Ngu Xa means 5 villages (Dong Mai, Chau My, Lang Thuong, DienTien and Dao Nien of Van Lam – Hai Hung district and Thuan Thanh – Bac Ninh) which has a casting bronze crafts. People in the 5 village pulled up Thang Long and set up the new village, get name Ngu Xa to remember the 5 village of their origin. They organized into wards own career, called wards cast bronze of Ngu Xa. Level cast bronze of Ngu Xa’s people reached peak. Success of the Ngu Xa’ s people in the conduct of casting copper products during several hundred years has confirmed the talent they are. Beside the intelligent creation, the eyes see the standard, hand dexterity and the careful, the craftsman also knows career and experience long. Recipes cast of Ngu Xa, according to traditional in step in molds, cooking bronze, pouring bronze of the product. From original design, follow orders, artists have to run two tasks: creating samples and molds. Samples often create from wax or candles. For craftsman, the most difficult is to make molds, and molds must be based on the model, there are many types of molds, but the material often used is more than clay, mud ponds, the paper, lime, mud in pond … A we use the dry sludge ponds dry, smooth finish ray ash mixed with ash, the paper has exposed small dried to frame the nature of training. Create the molds made of white clay. Artists always burn molds before casting. Adjust the temperature when burn campus is a difficult technique, requiring sophisticated, careful and experienced. Burn so the course on campus is not scratch to campus has not been to nine solid button, the associated array of campus venues not go in that border. When casting, artists special attention and focus every 2 to try to cook and the pouring of the molds.Cooking pure bronze and phase of the other metals of very seriously, to create alloy. They need to measure with the eye, by hand (that is estimated correctly), no modern machines do help. This is the secret techniques of professional specialty. For bell, need for more rare metals (gold, silver) in the bronze alloy. But the phase of more gold and silver always prepare for cast body and breast of bell, to create clear and sound and when it warm up. Bronze cooked simultaneously at a time, whether to concentrate on many furnaces. Pouring bronze into molds of the continuous. Thus, although molded product is also great to have no traces connect. Casting techniques of Ngu Xa has long been highly valued, have done for us and to the international effort to admire. Ngu Xa’s people in proud career of his cast, a job has become a valuable tradition of them. Speaking to the products of cast in Ngu Xa village that tell about bell and statue which are typical products, the unique art no trade villages can comparable. Who makes up the threshold of the walls by the hands pair of hapless workers cast here, will not chisel out praise by the sophisticated features on each line of the wall. 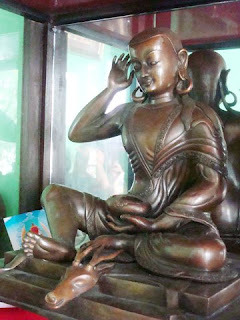 Bronze statue have everywhere. Many works have been regarded as a masterpiece of the art of casting Vietnam. Typically, as the Huyen Thien Tran Vu is located in Quan Thanh Temple is cast in the year 1677 of more than 3600 kg, together with Church’s bronze as candlestick, thurible, bronze crane … is considered the valuable things of the country. 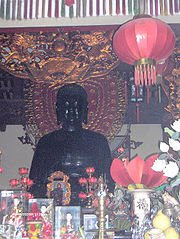 At the Than Quang temple village of Ngu Xa current Adida Buddha statue is located at the center of the pagoda. This is a work of art and unique and very sophisticated. It’s 3.95 meters high, the perimeter of 11.6 meters. Entire colossus weighs over 10 tons, is located on a bronze lotus court has 96 fields. Statue has balance sit simple hamonious cube. Contemplation the statue, viewers feel about indulgent, quiet of statue from the trait, body image, seat carriage, to sticky clothes, deep contemplation , but like real people. Features unique colossus also be cast in secret “cut column of the house”, the colossus casting a block of empty line, a technical communication casting of Ngu Xa village. But to get the wonderful colossus, a craftsman of Ngu Xa had to take a lot of effort, the mind as well as time can complete the work actually interested. There is products only two months but other work to be done in 6 months or when the annual. Typically there colossus Adida in Than Quang pagoda to take 4 years (from 1949 to 1952). Colossus by artists of the Nguyen are Nguyen Van Tung, Nguyen Phu Hien, Nguyen Van Tiep implemented. Bell is only the village of Ngu Xa cast to get echo and vibration sounds. Cast bell is wonder as casting statue. Although not much experience from the design photo, knead clay, pour gypsum … like the casting statue but casting the bell requires the body, shoulder of the bell must have thickness, thin variety. 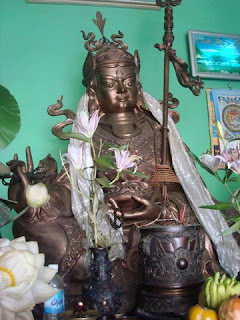 Therefore, from mold making, contract to prepare, cook and pouring of the molds must comply with a process very seriously and sophisticated, as more arcane new casting of the bell.Tran Vu statue in Quan Thanh Temple,Church’s bronze as candlestick, thurible, bronze crane of Ngu Xa considered as the valuable things.Missions abroad when contemplate the product of Ngu Xa casting from praise and admirability for the front and the dexterity of the artisans of Ngu Xa casting. They do not imagine the small workers can cast out the works great things. Nice information. I’ll come to Hanoi in Sept. Thanks!